This sharp 1955 Studebaker Hardtop sports a two-tone paint job as was quite popular in the mid-1950's. Three-tone paint jobs were also available for those who were so inclined. This was the first major facelift of the 1953 "Loewy Coupe" design. A large chrome grille opening incorporating the parking lights was added, and both front and rear bumpers were made larger and heavier. The amount of brightwork was increased and interiors were more colorful than in previous years. Studebaker sales increased significantly in 1955, so the restyle was a success by that measure. This picture was taken several years ago at the Colonial Virginia Meet in Yorktown, Virginia. 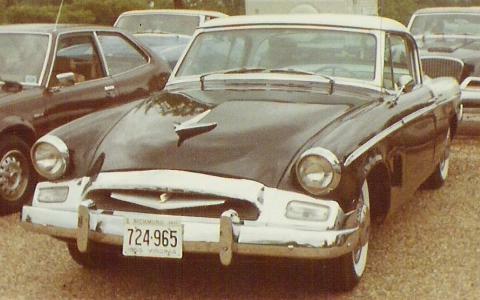 Studebaker hired Brooks Stevens Associates to restyle the Lark for 1962. One result was that the two-door models grew in length by nine inches. Round tail lamps and a revised trunk lid with a lower lip were the main exterior changes. For the first time, Larks could be ordered with a 4-speed floor shift transmission. This option was popular in the Daytona model which also featured bucket seats. The 289 cubic inch V8 with a four barrel carburator and dual exhausts was also available as an option. 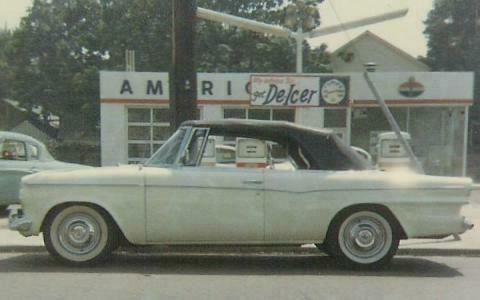 Sales improved significantly, and Studebaker model year production exceeded 100,000 units for the last time. 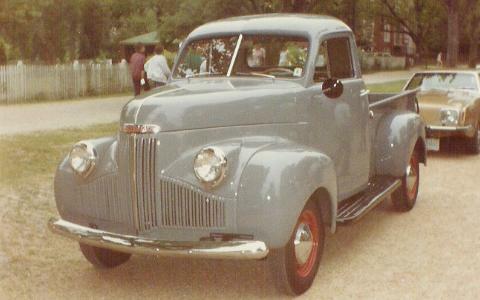 Studebaker introduced the M Series Pickup in 1940 and continued to produce this model through 1947. The standard engine was the same 170 cubic inch flathead six that was used in the Studebaker Champion. This cab type was also used on heavy duty trucks in a number of configurations. Many were produced as cab and chassis combinations which were sent to various specialty body companies for completion. This M Series also formed the basis for the Studebaker military 6X6 cargo trucks of World War II. This picture was also taken at the Colonial Virginia Meet. 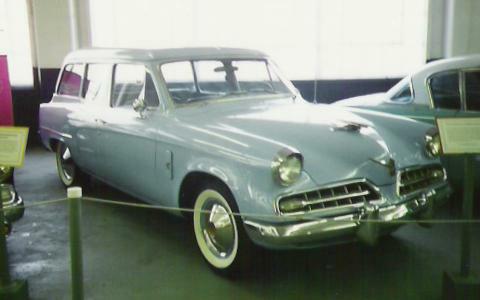 The restyled 1953 Studebaker line did not include a station wagon. However, a nice looking all metal two-door wagon was added in 1954. Studebaker named the new wagon "Conestoga" after a style of horse drawn wagon it had once produced. The new wagon was available either as a Champion six cylinder or a Commander V8. The "8" on the hood identifies this example as a Commander. The only difference between 1953 and 1954 styling was the addition of vertical teeth to the two front grilles. This picture was taken during my August 1994 visit to the Studebaker National Museum in South Bend.